Unvented roofs (aka cathedralized attics) are an established presence in Florida residential building markets. These roofs are built with a layer of spray polyurethane foam (SPF) on the underside of the roof deck. Such a roof configuration positions the heating, ventilating, and air-conditioning equipment and ductwork within the conditioned space and improves airtightness in practice (by shifting the air barrier from the ceiling to the roofline). However, SPF is more expensive than fibrous insulation. Some builders have also become wary of using SPF because of liability concerns about indoor air quality and offgassing. Unfortunately, unvented roofs that use only air-permeable fibrous insulation (cellulose or fiberglass) have been demonstrated to be at risk of moisture issues in climate zone 2A because condensation and moisture accumulation occur at the ridge. 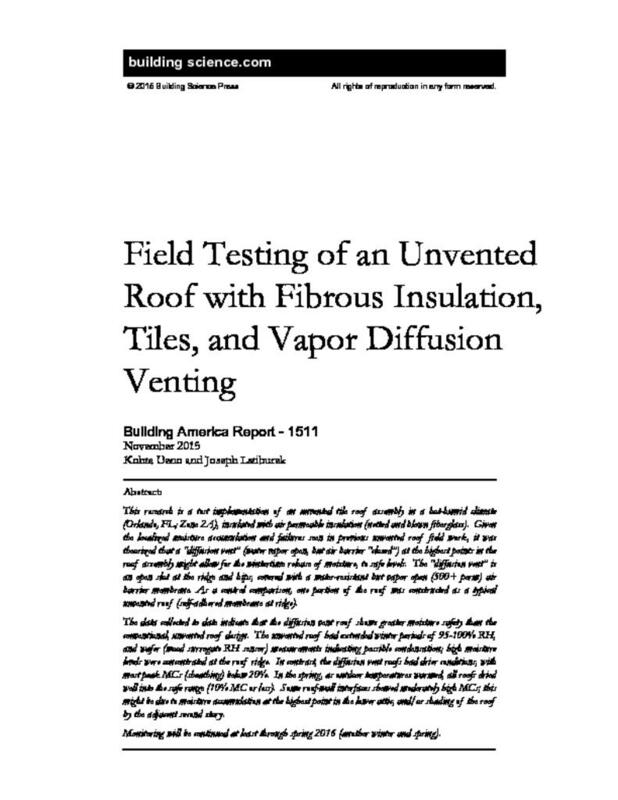 This report describes research about a test implementation of an unvented tile roof assembly in a hot-humid climate (Orlando, Florida; climate zone 2A); the roof was insulated with airpermeable insulation (netted and blown fiberglass). Given the localized moisture accumulation and failures seen in previous work, the U.S. Department of Energy’s Building America research team Building Science Corporation theorized that installation of diffusion vents might allow for the wintertime release of moisture to safe levels. Diffusion vents are open slots at the roof’s highest points (the ridge and hips) that are covered with a water-resistant but vapor-open (500+ perm) air barrier membrane. The test home is a two-story slab-on-grade structure (3,600 ft2); the roof was insulated with a prototype insulation system (called boxed netting), which allows full depth insulation (i.e., it is not limited by the depth of the truss top chord). As a control comparison, one part of the roof was constructed as a typical unvented roof (with a self-adhered membrane at the ridge). Ideally, failure would occur in the control roof and the experimental (diffusion vent) roofs would show sufficient drying to avoid failure. No intentional space conditioning was provided in the unvented attic so worst-case humidity buildup conditions could be observed. Instruments were installed to capture a variety of orientations and roof conditions including multiple roof ridges (both diffusion vent and unvented), hips, and roof-wall interfaces. Measurements included temperature and relative humidity (RH), wood moisture content (MC) (in sheathing), and a wood wafer sensor intended as an RH surrogate and condensation indicator. Instrumentation was completed in November 2014; the house was largely completed by February 2015 and occupied by homeowners in May 2015. As part of the commissioning process, the house and attics were tested for air leakage. The roof geometry includes an upper attic (over the second floor) and a lower attic (at the first floor where it was not covered by the second floor). The testing indicated that the overall house airtightness (with attic hatches open) was 7.6 air changes per hour at 50 Pa or 0.58 cubic feet per minute at 50 Pa /ft2 enclosure area. This result exceeds the 5 air changes per hour at 50 Pa target for climate zone 2. Measurements indicated significant leakage from the lower attic to the exterior (196 in.2 equivalent leakage area [EqLA]). In comparison, the upper attic had 35 in.2 EqLA and the conditioned space (first and second floors) had 311 in.2 EqLA (without door gaskets or finish floors). These air leakage results indicate that complicated details and roof-wall intersections can result in air leakage. However, the field (main body) of the roof and the diffusion vent ridge detail were not significant sources of air leakage. Data were collected from November 2014 through August 2015 (for 9 months); this captured a winter (during construction) through summer. However, data were not collected from January to mid-February 2015 due to site power problems, and this caused a data gap. The boundary condition measurements show that the upper/second-floor attic has the highest risk of coldweather condensation issues, because it has the highest dew point (air moisture content) from construction moisture. This situation is consistent with the upper/second-floor attic being (1) relatively airtight and (2) located at the top of the conditioned space (moisture stratification). Also, interior moisture loading is minimal before the data gap but is then significant (some 100% RH conditions in attics) after the gap due to drywall finishing and painting activities. The data collected to date indicate that the diffusion vent roof has greater moisture safety than the conventional unvented roof design. The unvented roof had extended periods (under cold winter conditions) of 95%–100% RH and wafer (wood surrogate RH sensor) measurements that indicated possible condensation. The high moisture levels were concentrated at the roof ridge, which is consistent with previous field experience in Texas, Florida, and California. In contrast, the diffusion vent roofs had drier conditions; most peak MCs (in sheathing) were lower than 20%. In the spring as outdoor temperatures warmed, all roofs dried well into the safe range (10% MC or lower). Some roof-wall interfaces showed moderately high MCs; this might be caused by moisture accumulation at the highest point in the lower attic, shading of the roof by the adjacent second story, or both. Monitoring will be continued at least through spring 2016 (another winter and spring). The interior moisture levels in winter 2015–2016 may clarify the risks of unvented roofs versus roofs with the diffusion vent detail. During winter 2014–2015, the interior monitored areas had high moisture levels due to drying of construction moisture. After the house was occupied, interior moisture was generated; however, the cooling system was operated through summer 2015, which resulted in dehumidification and less stored moisture in finishes and furnishings. The net effect of this change could be higher or lower interior moisture levels, which will depend on occupancy, behavior, and ventilation rates. Unvented roofs (aka cathedralized attics) are an established presence in Florida residential building markets. Such roofs are built with a layer of spray polyurethane foam (SPF) at the underside of the roof deck (Figure 1) as discussed by Rudd and Lstiburek (1998) and Lstiburek (2006, 2011). Primary advantages to this construction are that (a) the attic ductwork and heating, ventilating, and air-conditioning (HVAC) system are brought into the thermal and air barrier of the conditioned space and (b) air leakage at the ceiling plane (often complicated by interior detailing) is eliminated, which typically results in improved overall airtightness. Secondary advantages include reduced wind-driven rain entry (because attic vents are eliminated) and potentially reduced hurricane blow-off issues (due to differential pressurization). Disadvantages include higher first cost and slightly larger surface area (conductive losses); the latter factor is often negated because duct leakage to the exterior is eliminated. The U.S. Department of Energy's Building America team Building Science Corporation studied unvented roof assemblies, which have a higher risk of wintertime interstitial (hidden) condensation issues than vented roof assemblies. These risks are addressed in current building code with the requirement for air-impermeable insulation (i.e., rigid plastic foams) on the exterior side of the roof assembly; air-permeable (fibrous) insulation makes up the balance of the insulating value. This measure raises the temperature of the condensing surface (underside of the air-impermeable insulation), which reduces the risks of condensation. The minimum thickness of air-impermeable insulation varies by climate zone and is spelled out in §R806.4 "Unvented attic assemblies" of the International Residential Code (ICC 2009). For climate zones (CZs) 1A and 2A (Florida), the requirement is a minimum of R-5. The typical implementation in this market is to use full-thickness SPF (open cell [ocSPF] or closed cell [ccSPF]) as shown in Figure 1. But recently some builders have become wary of using SPF because of liability concerns about indoor air quality and offgassing (Gibson 2013). Although these issues may be linked to installation defects and/or certain manufacturers or formulations, builders are pursuing options for alternatives to SPF for unvented roofs. Other specifics to the Florida market are relevant to the selected roof design. One is the use of concrete tile as a typical roof cladding (Figure 2); rounded barrel tile and flat tile profiles are common. This material has the advantage of greater durability relative to asphalt shingles; lifespans are commonly cited at about 50 years. This roof cladding is effectively self-ventilated, in that an air space or air gap is created between the drainage plane/water resistive barrier and the cladding. This air gap allows drainage of bulk water and drying from the underside of the concrete tile. Due to the severe wind-driven rain and shingle blow-off issues that occur during hurricanes in the Gulf Coast, implementing fully adhered water control layers (or drainage planes) under the roof cladding is common practice. Typical materials include granule-coated roll roofing felt that is adhered with bitumen and bituminous self-adhered membranes (Figure 3). Given the requirements and constraints of the Florida market and available products, reexamining options for unvented roofs with air-permeable insulation appears to be an excellent opportunity for this measure. This research is a test implementation of an unvented roof design in a hot-humid climate (CZ 2A). The roof is insulated with air-permeable insulation (netted and blown fiberglass) and a diffusion vent detail at the ridge to allow for wintertime removal of accumulated moisture. One goal of the research is to determine the assembly’s resistance to condensation or the design’s moisture safety. This research has an additional advantage of potentially reducing the first cost of unvented roofs by eliminating SPF, which is a higher-cost material than fibrous insulations. In addition, two research sites examining unvented roof assemblies with fibrous (cellulose and fiberglass) insulation have been instrumented by Building America. These sites are located in Chicago, Illinois (CZ 5A), and Houston, Texas (CZ 2A). Both sites have asphalt shingle roofs. Does implementing an unvented cathedralized attic with air-permeable insulation (such as blown fiberglass) present issues in a hot-humid climate? One potential issue is air barrier continuity at roof penetrations and at the perimeter roof-to-wall interface. What is the air barrier performance of the assembly as installed? Does installing the diffusion vent present any issues with rain control or durability? For instance, are fastener penetrations a greater issue with this material? Did the roofing crew report any installation issues? Do wood roof sheathing and framing moisture contents (MCs) remain within acceptable ranges throughout the winter in this roof design in a Florida climate? Are MCs at the ridge higher than at lower sections of the roof—as experienced in previous work? Does the conventional unvented roof assembly experience higher MCs than the diffusion vent roof, and do these moisture levels constitute failure? Do the reservoir cladding nature of concrete roof tile and the vapor-permeable water diffusion vent present any risks of inward vapor drive? Or is the inward vapor drive risk a nonissue because of the vapor-open nature of the interior insulation assembly? Given the Building America goals of reducing home energy use by 30%–50% (compared to 2009 energy codes for new homes and preretrofit energy use for existing homes), this research is an effort to reduce the first costs of unvented roof assemblies. In hot-humid climates, unvented roof assemblies can be used to bring ductwork and air handling units into the conditioned space and improve airtightness. Doing so with materials that cost less than SPF (the current solution) may increase the adoption of this measure. This work also falls under the category of “2.0 Risk Reduction and Minimization” from the FY 2014 Residential Energy System Research Needs (NREL 2013). One of the goals of this research is to find moisture-safe methods to replace higher-cost SPF or rigid board foam with lower-cost fibrous fill insulation. The retrofit of an empty cavity (e.g., retrofit insulation of a cathedralized ceiling) is clearly cost-effective that is compounded by the moderate air sealing effects of dense-pack insulation. The installed cost of ccSPF varies strongly based on contractor availability, the size of the installation, regional pricing, feedstock (crude oil) prices, and access (e.g., requirement for lifts or scaffolding; confined space installation). However, a typical installed price used for estimation purposes is $1/board foot (1 in. × 12 in. × 12 in. ), although pricing varies in practice from $0.45 to $1.40/board foot. Figure 4 shows a comparison of insulation material costs based on “big box” home center pricing gathered from 2007 through 2011. It is shown using the normalization metric of $/ft2·R value, which normalizes the area costs based on the R-values. The figure shows values for extruded polystyrene, polyisocyanurate, fiberglass, cellulose, ccSPF, and mineral fiber. Note that ccSPF is included in the graph with a caveat: no isolated material cost is shown for ccSPF, because it is effectively manufactured and installed in a single step. An estimate was made using the $1/board foot price and dividing by 2 (50% materials and 50% labor). The graph shows that ccSPF is priced comparable to the rigid board foam plastic products (extruded polystyrene and polyisocyanurate), which are both substantially more expensive than cavity fill fibrous insulation such as fiberglass or cellulose. The basic benefits of retrofit insulation of compact roof assemblies (including cathedralized ceilings) include energy savings from reduced heat flow and reduced airflow and possible thermal comfort improvements (due to radiant surface temperature effects). Benefits of unvented roof assemblies in hot-humid climates include energy savings from eliminating duct conductive and air leakage losses; shifting the enclosure geometry to the roof line commonly improves building airtightness. Also, bringing the ductwork and HVAC equipment within the conditioned space can reduce the risks of surface condensation on cold equipment surfaces compared with high-dew-point attic (essentially exterior) air (Figure 5). This condensation adversely affects durability of mechanical equipment over time. Many contractors and cellulose sales people falsely believe that dense-pack assemblies are “airtight”. This has been shown not to be the case (Derome 2005, Schumacher 2011) – with disastrous consequences in cold and mixed climates where roof rafters have been “dense packed” with no provision for rafter ventilation (to remove moisture) or for control of condensing surface temperatures (to minimize moisture accumulation) (Lstiburek 2010b). Approximately two assemblies in ten fail – typically within 10 years (Fitzgerald 2010). Top vent decks: airspace under the asphalt shingles and roof cladding. This creates a drained and ventilated cavity (Figure 8) (Lstiburek 2010a; Straube and Burnett 2005). This is not a common assembly with asphalt shingles and was considered somewhat experimental or conceptual. Miller et al. (2006) performed field testing and simulations on roof assemblies ventilated between the cladding and sheathing. They determined that a stone-coated metal shake roof on a batten/counterbatten ventilation space reduced cooling season heat flux by 40%–50% (including ventilation and emissivity effects) compared with a direct-applied dark asphalt shingle roof. Simulations indicated that the ventilated air space case has enhanced sheathing (oriented strand board [OSB]) drying relative to the case with no ventilation above the sheathing . . .